Denomination : AE 29 (probably a 1/2 drachm). Reference : Sear Greek - 7900. SNG Cop-304 ff. Svornos-1424. Size : 29.0 x 30.5 mm. Weight : 23.11 grams. Grade : VF with good surfaces, mid-brown patina with sandy highlighting. 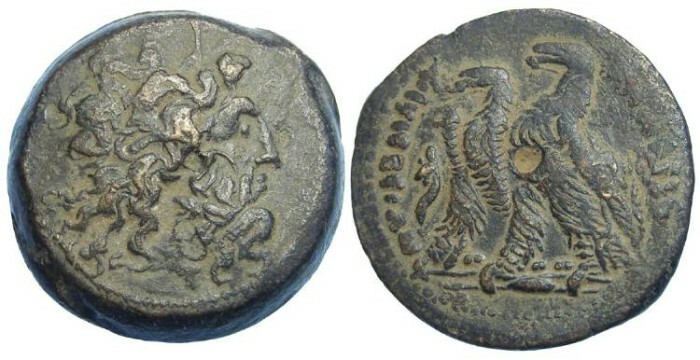 Reverse : Two eagles standing left with wings folded, with a double cornucopiae in the left field, and PTOLEMAIOY BASILEWS around. The double eagle reverse is symbolic of two Kings on the throne at the same type. It only appears on Ptolemaic bronzes in two periods, with the other being the brief joint rule of Ptolemy I and II. I disagree with the currently accepted designations of which Ptolemys are Ptolemy VII (Philopator) and Ptolemy VIII (Euergetes). Euergetes was on the throne jointly with Philometor, before Philopator came to the throne. Euergetes official status is recognized on the coins via the double eagle symbol. As such I feel Euergetes should rightfully be Ptolemy VII, and Philopator should be Ptolemy VIII during his brief rule between the joint and sole reigns of Euergetes. However, I have used the currently recognized system in this listing.